What familiar item symbolizes savings? A piggy bank, of course. So, it's no wonder that the folks at Border State Bank chose two charming inflatable mascots as their regional good-will ambassadors. First, the Greenbush, Minnesota-based bank converted a classic Volkswagen Beetle to "Pearl," an adorable girl pig. Then they asked Landmark Creations to design and build her male counterpart, "Earl," an inflatable porker. Standing eight feet high and 13 feet wide, Earl makes a dramatic entrance at events, parades, and open houses. According to Border State Bank Communications Director Shawn Mason, "We are getting a considerable amount of attention, which gives our team members many opportunities to become engaged with customers." In fact, Earl has proved so popular that the community-focused bank plans to use him in future promotions. Says Mason, "We have produced key chains, piggy banks, and magnets" matching the giant cold-air inflatable. In 2018, Earl will help launch the bank's financial literacy program for children. 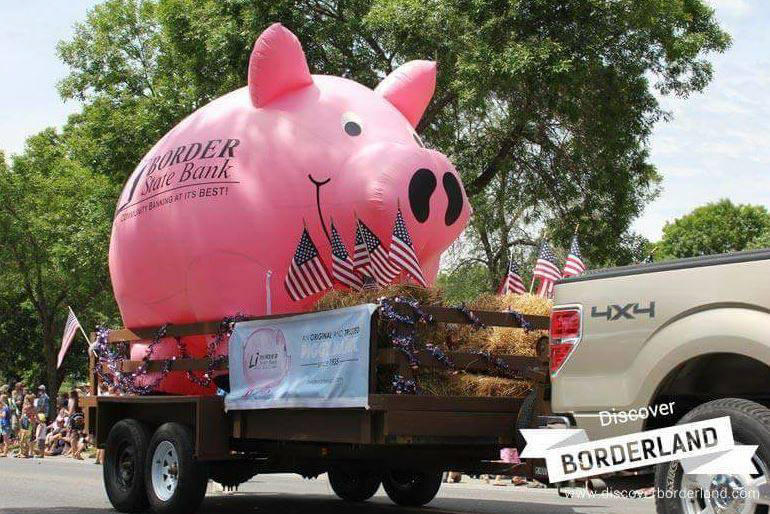 Why did Border State turn to Landmark to create its giant inflatable piggy bank mascot? According to Shawn Mason, the bank admired the "giant small-mouth bass" Landmark built for the Annual Bass Championship at International Falls. "We were so impressed," he relates, "that we asked organizers where they got [the inflatable fish], and they led us to" Landmark. Earl's fans would agree it was the perfect choice.